Henrys.com : CANON IPF PRO-4000 PRINTER 44"
The LUCIA PRO ink set adopts newly formulated 11-colour pigment inks and a Chroma Optimizer. This system helps you achieve fantastic colour reproduction, image clarity, and enhanced darker areas. It faithfully reproduces colours and dark areas crucial for printing works of art. The blue and magenta inks will help recreate the finest details when printing nightscapes and sunsets. A first for the Canon large format printers is the addition of a Chroma Optimizer. Used when printing on glossy and semi-glossy paper, this acts as a clear coat, improving colour performance and gloss characteristics enriching the dark areas of a print. This new ink set helps: Enhance gloss uniformity, improve scratch resistance, enhance dark area reproduction, reduce graininess. The colour calibration function is designed to produce consistent colour reproduction. This new printer includes an upgraded, built-in colour densitometer that offers precise calibration and colour matching. Using a three-colour LED and a newly developed condenser lens the sensor enables accurate recalibration of the device, allowing you to maintain a low average printer-to-printer colour difference. The colour calibration is finished quickly after a few simple steps on the printer's operation panel. A single colour calibration performed with one type of media can be applied to media in all printing modes. The Device Management Console software, ideal for fleet management, lets you perform colour calibrations remotely. This software lets you monitor the printer status of up to 50 units from any location in the world, be notified via email when an error has occurred, or check the amount of ink left in the printers without ever having to leave the comfort of your desk. The newly developed unibody structure provides a platform for stable print head scanning which allows for precise ink drop placement. 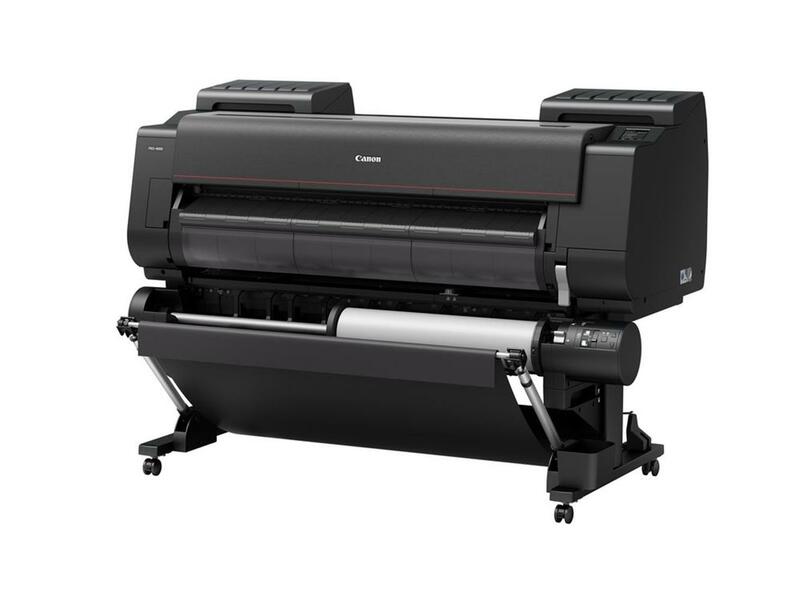 The optional dual purpose Multi-Function Roll can act as a two roll media system during the day when production is high and become a bi-directional Take-up unit at night when large, unattended prints are running. Creating large format prints is now easier with the introduction of Print Studio PRO for imagePROGRAF large format printers. This software offers features that streamline your printing workflow. Compatible with Canon Digital Photo Professional software, Adobe Photoshop software, Adobe Lightroom software and Adobe Photoshop Elements, Print Studio PRO offers versatility never before seen with Canon Large Format printing. The large 3.5" colour LCD touch panel makes it easy to view printer information as well as perform simple operations. PDF and JPEG files can be directly printed on the imagePROGRAF PRO-4000 from a USB thumb drive. Simply input the thumb drive into the USB port on the printer, preview the image on the operation panel, and print! Fast and easy printing without the use of a computer. Available in 160ml, 330ml, and 700ml ink tanks, you have the flexibility to purchase ink based on the colour frequency at which you print. In today's printing environment, it is more important than ever to understand how much ink and media each print job is costing your business. Both Mac and Microsoft compatible, Accounting Manager serves as a powerful feature, used for accurately managing your print costs. With the Accounting Manager feature you can track how much ink and paper is being consumed when printing in large format of up to 50 printers! Each individual ink tank can have its own cost associated to it, as well as a variety of different paper types.